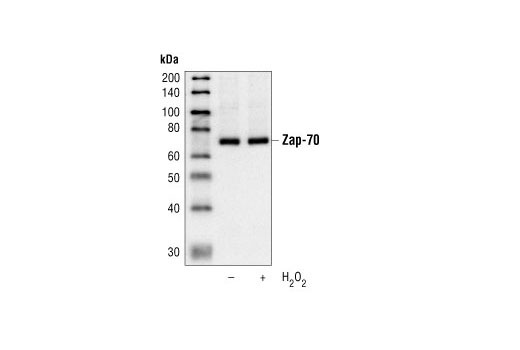 Western blot analysis of extracts from Jurkat cells, starved for 16 hours and either untreated or H2O2-treated (2 mM for 3 minutes), using Zap-70 (99F2) Rabbit mAb. 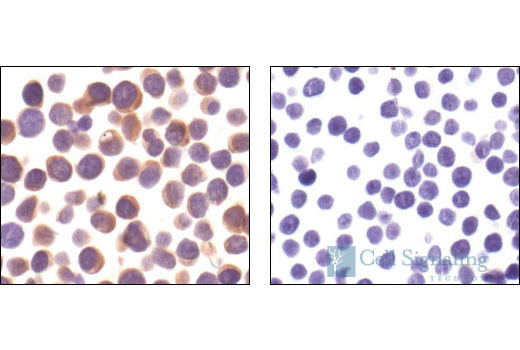 Immunohistochemical analysis of paraffin-embedded Jurkat T cells (left) and Ramos B cells (right), using Zap-70 (99F2) Rabbit mAb. 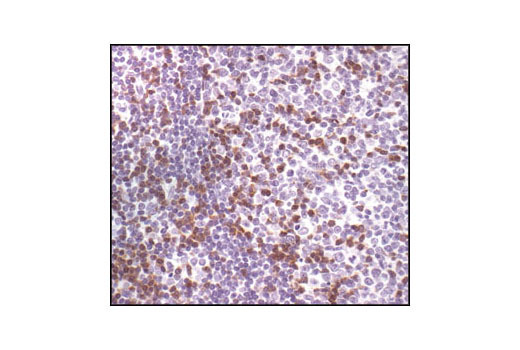 Immunohistochemical analysis of paraffin-embedded human tonsil, using Zap-70 (99F2) Rabbit mAb. Flow cytometric analysis of Ramos B cells (blue) and Jurkat T cells (green), using Zap-70 (99F2) Rabbit mAb. 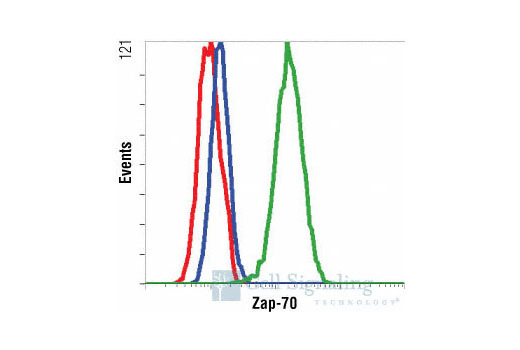 Zap-70 (99F2) Rabbit mAb detects endogenous levels of total Zap-70. Monoclonal antibody is produced by immunizing animals with a synthetic peptide corresponding to residues surrounding the amino-terminus of human Zap-70. The Syk family protein tyrosine kinase Zap-70 is expressed in T and NK cells and plays a critical role in mediating T cell activation in response to T cell receptor (TCR) engagement (1). Following TCR engagement, Zap-70 is rapidly phosphorylated on several tyrosine residues through autophosphorylation and transphosphorylation by the Src family tyrosine kinase Lck (2-6). Tyrosine phosphorylation correlates with increased Zap-70 kinase activity and downstream signaling events. Expression of Zap-70 is correlated with disease progression and survival in patients with chronic lymphocytic leukemia (7,8). Iwashima, M. et al. (1994) Science 263, 1136-9. Neumeister, E.N. et al. (1995) Mol Cell Biol 15, 3171-8. Chan, A.C. et al. (1995) EMBO J 14, 2499-508. Williams, B.L. et al. (1999) EMBO J 18, 1832-44. Di Bartolo, V. et al. (1999) J Biol Chem 274, 6285-94. Wiestner, A. et al. (2003) Blood 101, 4944-51. Crespo, M. et al. (2003) N Engl J Med 348, 1764-75.